Jeep to Produce New Grand Wagoneer? Ford having muddled through the 1970s without any major breakthrough innovative cars, was changing its tune by the 1980s. Ford decided by the early 1980s to cast its stodgy image aside and begin to build innovative and modern looking cars. The 1979 Fox bodied Mustang was the initial catalyst in this change in policy. It was Ford’s first vehicle to incorporate modern European styling. It was a pleasant change from the boxy Fairmont, Granada, LTD, and other boring products Ford produced at the time. A few years into the 1980s, Ford had a new aerodynamic state-of-the-art Thunderbird and even a new hip modern Lincoln – the Mark VII LSC. By the early 1980s with the ever tightening government Corporate Average Fuel Economy (C.A.F.E.) standards and the after effects of the 1979 oil crises, automakers were preparing themselves for the possibility that V8 engines would be soon phased out. The large displacement ones by this time were long gone in passenger cars and only small displacement low output V8s were left. Automakers where now willing to replace V8s with V6s or even four-cylinder motors. Ford was ahead of the curve on this when it came to the Mustang. Competition from the Chevrolet Camaro and Pontiac Trans Am had forced Ford to put some guts back into its Mustang by 1982 in the form of a revived Mustang GT with a 5.0 liter (302 CID) H.O. V8. Ford had toiled in late-1970s with a 2.3 liter turbo four-cylinder motor. The 2.3 turbo made its debut as an optional motor in the 1979 Ford Mustang and Mercury Capri, and it made a healthy 132 horsepower which was around the same horsepower as Ford’s 5.0 liter (302 CID) V8 during this time. 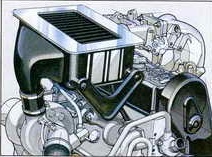 The 2.3 block was an Overhead Cam (OHC) design. The OHC 2.3 was first introduced European market by Ford’s European division. It was successful engine in this market, so Ford decided to offer it in the 1974 Pinto. The OHC 2.3 produced plenty of horsepower for a four-cylinder while providing excellent gas mileage, it made it the perfect economy motor for the troubled 1970s. The early 2.3 turbo motor as first introduced in 1979 had its share of problems that were mostly related to the turbo or dealer servicing of the turbo unit. This may explain why Ford dropped this motor after the 1980 model year. Fortunately it was just a short hiatus, the engine returned again in 1983 as an option on the Mustang and new Thunderbird. However this new 2.3 turbo was a much improved motor. Gone was the low-tech 2 bbl. carburetor, in its place a new high-tech computer controlled port injection system that provided precise fuel metering and better performance. The net result was 145 horsepower and 180 lbs/ft. of torque. As a comparison Ford’s 5.0 liter (302 CID) throttle-body fuel injected V8 in the 1983 Ford LTD Crown Victoria was rated at 130 horsepower. Ford realized immediately the potential of this new 2.3 turbo and began marketing it as a fuel-efficient performance alternative to the V8. For instance Ford offered the 2.3 turbo in the 1983-1984 Mustang GT and Mercury Capri RS – it was a good alternative to the fuel thirsty 175 horsepower 5.0 liter H.O. V8 which was the standard engine in both cars. And in the Thunderbird 2.3 turbo would be the top performance engine option from 1983 to 1988 (in the Cougar it would be the top performance engine option from 1984 to 1986). Needless to say in the Thunderbird and Cougar, the 2.3 turbo sold very well. However in the 1983-1984 Mustang GT, the 2.3 turbo was a flop. Most buyers who were muscle car traditionalists went for the higher horsepower 5.0 liter H.O. V8 even with its lower fuel economy. With the deep sound of a V8 emanating from the dual outlet exhaust and lots of low end-torque, it was tough for the traditional performance Mustang buyer to part with the V8. However Ford had something up its sleeve, something so big it would shake the automotive world to its knees and prove that it could offer a “world class” performance Mustang. And Ford’s hot 5.0 liter H.O. V8 did not fit into this new plan. Ford decided to drop the 2.3 turbo option in the Mustang GT, it would have the GT soldier on with a 5.0 liter H.O. V8 not to upset the GT’s main customer base. Instead Ford decided to offer a more European style performance Mustang. One that would be the ultimate performance Mustang with all the best high-tech features Ford could muster. The centerpiece of this new Mustang would be an even more potent 2.3 turbo. And unlike the GT, it would also handle and brake better and offer a much more complete performance package. Where the GT feel short this new Mustang was going to fit the bill. This new Mustang was called the SVO. The SVO was short for Special Vehicle Operations. Anyone familiar with the current SVT (Special Vehicle Team), the SVO team was the precursor to this team. It was a team of individuals who worked feverishly to build a hi-tech Mustang sports car. The heart of the new Mustang SVO was a 2.3 turbo which produced a healthy 175 horsepower which happened to be the same output of the more than double its displacement 5.0 H.O. in the 1984 Mustang GT. And surprisingly the SVO’s torque (for a four-cylinder) was almost in V8 territory with a robust 210 lbs of torque at a low 3,000 rpm as a comparison the 5.0 H.O.4bbl V8 in Mustang GT produced a 245 lbs/ft. of torque at 2,400 rpm. However the automatic transmission equipped 1984 GT had a 5.0 liter Central Fuel Injection (CFI) which was a Throttle-body fuel injection (TBI) system, made 165 horsepower, 10 less than the SVO’s little four-cylinder. The SVO moves off the line with authority with not much turbo lag, the engine is smooth and provides enough punch to please most sports car enthusiasts. 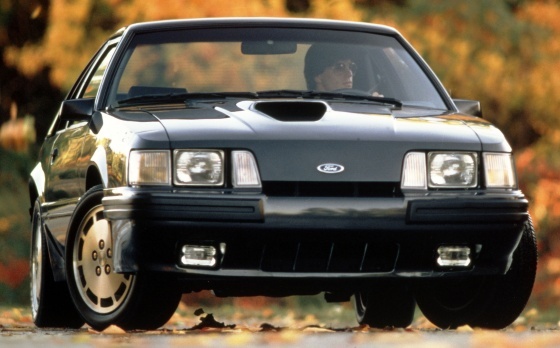 The one surprise to Ford fans (who are used to the roar of a V8 in their performance fox bodied Mustangs) is the whine of the turbo four-cylinder which has a more European flair than what muscle car fans are used to. The 2.3 is a high revving little motor, where the 5.0 H.O. is more comfortable at easily obtainable lower rpm. This engine alone attached to the GT’s suspension and handling package would have provided a well rounded package. However the SVO team would have no part of that, they re-engineered the entire car to make a super Mustang. Where the 1984 Mustang GT had only rear drums the SVO had big rear disc brakes. Other improvements were the quicker ratio steering box (20:1 verses the GT’s 15:1), which was a TRW unit and reworked suspension with upgraded shocks (and even better more performance-oriented Koni shocks were used starting a few months into the 1984 SVO production run). Helping the upgraded suspension was the lighter weight 2.3 motor verses the heavier 5.0 liter H.O. V8 which gave the SVO much less weight under the hood. This loss of weight in that area gave the SVO a more balanced front to back weight distribution and allowed better more nimble handling. The net result was a skidpad result of .85 g which was better or on par with most exotic sports cars at the time. The 1984 Ferrari 308 GTSi/GTBi also obtained an .85 g on the skidpad. The 14 inch pizza cutter wheels and tires of the Mustang GT just did not make the grade, so the SVO team used 16×7 inch wheels mounted on wide Goodyear NCT P225-50VR-16 tires which were VR speed rated – the highest speed rating for a production car tire at the time. Only a few select performance cars at the time came with tires with this high-speed rating – the 1984 Ferrari Testarosa and 1984 Chevrolet Corvette are examples of other high-performance cars from this era with VR speed rated tires. Also worth mentioning is that the SVO’s 16 inch wheels were a five lug design verses every Fox body Mustang GT which only had four lug wheels. The first thing most people noticed when looking at the SVO was the massive hood budge air inlet. It was more than decoration; it provided plenty of fresh air for the turbo’s intercooler. The turbo on the SVO’s fuel injected 2.3 was an AiResearch Turbo Unit that pumped out an impressive 14 PSI of boast. Providing the engine management was a sophisticated EEC IV processor. The net result was a standing 1/4 mile time of 15.5 seconds and a 0-60 mph time of 7.5 seconds. This may not seem fast by today’s standards but back in 1984 this was lightening quick. And this was just the beginning by 1985 horsepower for the 3,200 lbs SVO was up to 205 which equated to even faster times. The SVO’s 2.3 turbo was one of the most powerful four-cylinder motors back in 1984 only the exotic Lotus Esprit’s 205 horsepower turbo Double Overhead Cam (DOHC) four-cylinder produced more horsepower. However the Esprit cost more than three times what the SVO did, which made the SVO a downright bargain in comparison. There was only one transmission available on the SVO and it was the Borg Warner T5, which came with a standard Hurst shifter. The rear was a performance-oriented solid rear axle with a 3.42 gear ratio and standard Traction-Loc (Ford’s name for a limited slip differential). Where the standard Mustang interior was pedestrian, the SVO was actually quite attractive and luxury oriented. The steering wheel and shifter knob were both wrapped in leather. The standard interior seating was plush cloth and the optional seating surface was leather. The front seats were expensive Lear Siegler seats that had pump-up lumbar supports. The interior only came in one color – charcoal gray. Surprisingly the SVO was not available with a convertible top option or even T-tops like other Mustang models. If a SVO buyer wanted an “open air” option, the only one available was the factory sunroof. The best thing about the SVO was its looks. Missing were the showy decals of the GT. And added was an attractive European Ford Sierra (Merkur XR4Ti) bi-plane style spoiler, side lower panel spoilers which included flares right in front of the rear wheels, and a new front air dam which housed twin fog lamps. However the icing on the cake were the new flush mounted front parking and turn signal lens. However the twin headlamps were recessed. Overall the SVO’s styling was clean and had a strong European flair. It was subjectively the best-looking Fox body Mustang upon its release and future Fox body Mustangs borrowed from some of the SVO’s styling cues. Fortunately there were four different exterior colors offered on the 1984 SVO, giving the buyer a little variety; Silver Metallic, Dark Charcoal Metallic, Medium Canyon Red and Black. However more worthy to note how the advances of the SVO took so long to make it to other Mustang models even after its short life. For instance rear disc brakes never made it as an option on the Fox body Mustang GT (the 1993 Mustang Cobra would be the only other Fox body Mustang besides the SVO to get rear discs). The SVO would be cancelled after the 1986 model year due to poor sales. Part of the reason was the success of the V8 powered Mustang GT. Though the Mustang GT lacked the sophistication and sheer all around performance tuning of the SVO. It had one big advantage – it was about $6,000 less than the SVO. The SVO had a base price of just under $16,000, which for all it offered was still a bargain compared to most sports cars at the time but the V8 powered Mustang GT offered the most bang for the buck of any performance car on the market back in 1984. And performance-oriented buyers tend to prefer larger displacement motors especially V8s, which make with ease plenty of low-end torque. Only 4,508 SVOs were produced for the 1984 model year, most surely production would have been more had there been no GT available for 1984 (total 1984 Mustang GT production was 32,914). However the final blow to the SVO was the massive unexpected fuel price drop in 1985 where gas dipped below $1.00 per gallon. A fuel-efficient sports car like the SVO in this type of environment suddenly had no purpose and sales fell. During this time GT sales soared and would remain very robust for the remainder of the 1980s. The SVO was such a complete all around package – it accelerated, handled, and stopped like a true sports car should while being fuel efficient. It was a car ahead of its time. It is a pity that Ford did not keep the SVO alive by offering a V8 option. A 5.0 liter H.O. (302 CID) powered SVO would have surely had a massive bump in sales and would have licked the Mustang GT’s competitors – the Camaro and Firebird which beat the GT in the area of handling and braking. And if Ford really wanted to dominate a 5.8 liter (351 CID) H.O. powered SVO would have fit the bill real well.